The media continue to discuss the killing of three Russian journalists in the Central African Republic (CAR). What sort of a country is this? What is going on there? Why did they go there? What is the reason why they were killed? What is Russia’s interest in the CAR? The CAR, a former colony of France, is a small African country with a population of almost five million, of which Christians (50 percent of them are Protestants) account for 80 percent and Muslims for 20 percent. Christians are mainly engaged in crop farming and Muslims in nomadic cattle-raising. It is one of Africa’s poorest countries with a per capita GDP of about 700 dollars. One dollar a day is considered not so bad. Seventy percent of children are illiterate. Like almost all the countries of Africa, the CAR is rich in mineral resources – gold, diamonds, uranium, oil, etc. The CAR was a problem country from the very moment of gaining independence. It has seen never-ending coups (as a rule, incited by France) and intertribal clashes. It is here that the notorious “emperor” Jean-Bedel Bokassa, who liked to relish human flesh, ruled. Incidentally, French President Giscard d’Estaign called him his relative and friend. In 2012 or so, the clashes began to show the clear signs of an interdenominational conflict between Christians and Muslims. 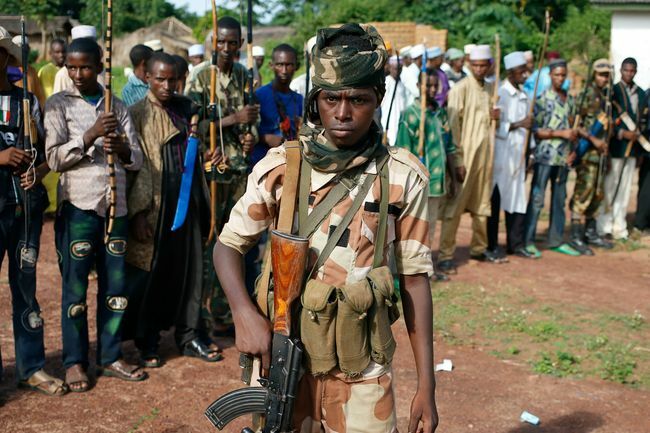 Muslims and Christians formed the Seleka and the Antibalaka organizations, respectively, which are constantly fighting for power. France and the UN moved in their peacekeeping forces which reduced violence a little. Yet a million people had to leave their homes. The year 2016 saw the election of a neutral Faustin-Archange Touadera as president. But his government controls the capital and its suburbs only. After several French soldiers were killed, France withdrew almost all of its troops. The 12,000-strong UN peacekeeping force is only busy ensuring its own security. Two battalions of the local army (1,300 men) have no modern arms and equipment. The capital is surrounded by Selaka detachments. Who can the president rely upon in his desire to establish order in the country? He requested the president of France to bring back the troops. Emmanuel Macron refused to do so. In October 2017 Touadera met with Sergey Lavrov in Sochi. As soon as in March 2018 Moscow announced rendering free military aid to the CAR. The UN Security Council approved this, although there has been an embargo on weapon supplies to the CAR since 2013. Touadera met with Vladimir Putin in late May 2018 in St. Petersburg. Russia sent 5 military and 170 civilian instructors to teach local soldiers to use the supplies weapons. Thus the CAR saw some young polite “little men” (not to be confused with “green little men”) with military bearing. In addition to their main occupation, they undertook to provide the president’s security. Touadera has also appointed a Russian, Valery Zakharov, as his national security adviser. They are all associated with the private military firm Wagner run by the well-known Russian billionaire Yevgeny Prigozhin who is close to Putin. The Wagner commander Dmitry Utkin, a former military intelligence officer, is subordinate to Prigozhin. Formally, everything is clear and open here – the president’s invitation and a UN SC approval. The experienced Russian journalists were apparently interested in something else, while Wagner’s activity was just a not so reliable cover. This is why they did not insist much when they were refused entry to the Wagner base at the former residency of “emperor” Bokassa. Instead, they went north, to the place of Lobaya Invest diamond mines. This firm is a subsidiary of M-Invest which belongs to the abovementioned Prigozhin. Although considered in Russia to “specialize” in African gold (Sudan, CAR), he does not shun diamonds, of course. It is risky and dangerous to do such cost-effective business in such as troubled country, all the more so that there are already about 1,400 Russians in the CAR. There are also journalists among them, who are engaged in anti-French propaganda. The fact that 175 Russian military instructors came with UN SC permission shows Russia’s professionalism in combining high diplomacy (at the UN level) with business interests of its oligarchs. The Russian embassy is also working in Bangui and, as events show, they are quite worth their salt. The Russian journalists must have intended to trace the “Wagner-business-diplomacy” connection. And who will allow somebody to poke their nose into the holy of holies – into oligarchic deals? The punishment was quick and harsh. I am sure nobody will ever know the truth. The most “ironclad” version Russia’s Foreign Ministry supports is robbery. A total of 8,500 dollars the journalists had is big money in the CAR. 1. It gets rid of uncontrollable, inquisitive, and oppositional journalists who were friendly to Ukraine to boot. 2. There is an opportunity to “kick” again the oppositionist Mikhail Khodorkovsky who financed this trip. 3. This shows complete failure of the French and UN “blue berets” to establish order in the country the ostensibly control. 4. This shows the Russian government’s “concern” over the destiny of its citizens all over the world, including the faraway Africa. The current events in the hitherto uninteresting CAR spotlight quite essential changes in global politics. Lavrov said recently in Rwanda: “Africa is an important cornerstone in the formation of a new world order.” He also promised to help African countries increase their role in the UN. So far, Russia is actively increasing its own role in Africa. A Bangui-based UN official said that “France, the US, and the EU… did not expect the Russians to arrive.” He described the mechanism of their “arrival” quite correctly: “They shamelessly bribe all those who open the right door to them.” Another UN diplomat concludes: “This may be a real test of decisiveness, strength, and influence for the West. If we surrender the CAR, we will surrender all of Africa.” Here is an interesting example. To somewhat neutralize the impression of the supply of Russian weapons, the US handed over a few dozen Ford automobiles to the CAR army. And now Russian commandos are riding on them across the capital. Ronak Gopaldas, director of South Africa’s consulting company Signal Risks, sums up Russian policies in Africa as follows: Russia’s strategy in Africa is a combination of a hard governmental policy, first of all, military operations, and energy diplomacy. Russia already has sort of an enclave of dependent countries in Africa today. It is Sudan which suggests that Russia build a naval base in the Red Sea; Burundi, where, as a result of the national public vote, the current president will reign until 2034; and now the CAR. The newspaper Den wrote more in detail about Russia’s policy in Africa on March 7-8, 2018. Experts believe there is also a Chinese link in the CAR events. It is unavoidable in Africa. As part of the Big Maritime Silk Road project, China plans to connect Western African countries with Eastern African ports. For this purpose, they intend to build a major West-East transport corridor centered in the CAR. For China to implement this idea, the CAR should be stable and calm. Who can provide this? There is little hope for the national government. The US and Europe fall away, for they are rivals. It is Russia that meets all the demands of China as a BRICS partner. This is why China supported Russia’s steps in the CAR and even tried, immediately after Russia, to get permission for supplying weapons and, accordingly, sending Chinese instructors to the CAR. China has even stockpiled arms on the border with Cameroon. But the UN SC did not like and rejected this idea of China. The developments around the CAR are only one example of the gradual and, at the same time, very fast establishment of a new world order based on the right of force. The US and Europe are gradually receding to the background, for they are unable to counterpoise China’s economic might, on the one hand, and Russia’s cynicism and aggressiveness, on the other. And Africa is becoming the main field of this geopolitical battle.